Judge Orders Britney to be Booked for Hit-and-Run Charges! 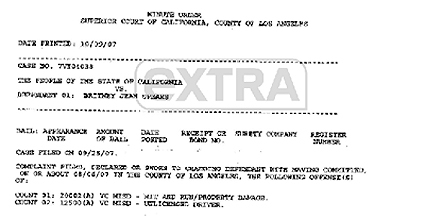 “Extra” has obtained the minute order from the Superior Court of California that was issued today in regard to Britney Spears’ alleged hit-and-run in August. The court order reads, “Defendant [Spears] is ordered to return proof of booking on the next court date,” which is set for October 25. That means that Britney must be fingerprinted and photographed before Oct. 25, when she is required to appear in court. Britney did not appear for today's hearing. Her attorney said that she can go to any L.A. police station for her mug shot.